Spellink Server is a web-based application, which implements multilingual spell-checking capabilities in a web application. Spellink delivers full-featured high-quality tool for accurate input and error free information on the Web in 8 languages. Spellink Server functionality is based on a sophisticated morphological engine, which derives lexical word forms from the dictionary to provide accurate spelling results. 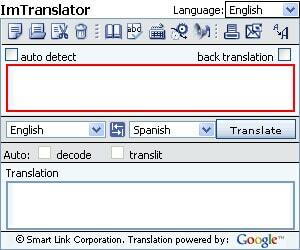 Spellink allows users to change the language on-the-fly in order to check spelling in a multilingual document. Spellink Server supports custom dictionaries with editing capabilities. It includes the options of setting the spelling preferences that affect the way the spell-checker works. Spellink Server works via standard client-server model and provides COM interfaces for its core functions. It can be installed as a component on any NT-machine and be easily maintained as a web-server on the top of Microsoft Internet Information Server. New languages can be developed per customer's request.